Since most of my friends also had today off, I decided to invite people over to do stuff. I think standing in line all night to buy stuff I don’t need is insane, so it was much better to stay home and work on projects. (Well, I did go out for food.) There was a sweater finished and a pattern re-drafted and tested. What I did not do was anything with the loom. I’ve had this warp there for months, half of it was a wedding gift from July. The other half was supposed to be a gift for someone else. Someone I’m not exactly on good terms with at the moment. While I suppose it’s good that I didn’t rip it off the loom and throw it away, it’s been sitting there taking up space. I can easily change the tie-up to get a new pattern, but I can’t decide what. The fabric is dense and not really suited for clothing or dishtowels. The only thing I can come up with would be a bag of some sort. I did promise The Boyfriend some bags for various things. It would make nice bags. I had the project planned and the warp measured before the ugly falling out, it was all I could do to get it on the loom and get the wedding present done. I’m not sure I want to look at it again once it’s finished. If I can get that far. Posted by feorlen on 23 November 2007 at 7:10 pm under weaving. I’ve gone and done it, I installed WordPress. I have an actual modern blog! All the same old content is here, and I’ll be adding the old posts. Posted by feorlen on 21 November 2007 at 8:44 pm under admin. Oh Look! A Blog Post! Yes, yes, I’ve been seriously lax. It has a lot to do with that Real Job I got a while back. But things have settled in and I’ve started thinking about the website again. 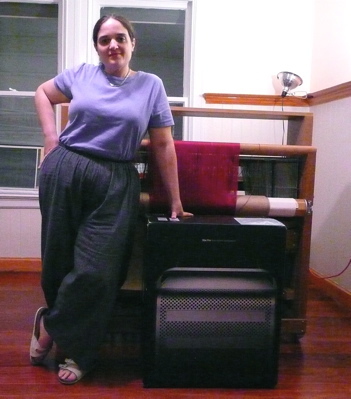 I’ve lately been only sewing regular clothes (now four sizes smaller, yay!) which I find mostly boring to talk about. I realize that it’s still a fairly unusual activity these days, but as far as I’m concerned it’s at about the level of blogging what I made for dinner. Yawn. The new server arrived, and while there are a few details to straighten out with my order from the Apple Store (like they sent me the wrong damn operating system version?!) it’s happily running on the internal network while I get it configured to my liking. (Thank you, Developer Seeding.) When this is done I’ll have an actual normal blog. I’m sure re-implementing RSS would be an interesting intellectual exercise, but I’m over it. WordPress, here we come. Posted by feorlen on 11 November 2007 at 8:59 am under admin.